Peggy Young, vice president of ScotFest, thinks jousting is integral to her festivals success. “I love it,” she says. “I love to watch these massive guys in full armor — their accuracy, horsemanship and control is amazing.” Young has three events for jousters: the rings, where jousters have to ride and spear them with their lances; the Quintain, where jousters aim at boards; and the big draw, the competitive joust, where challengers thunder down the arena to face off. 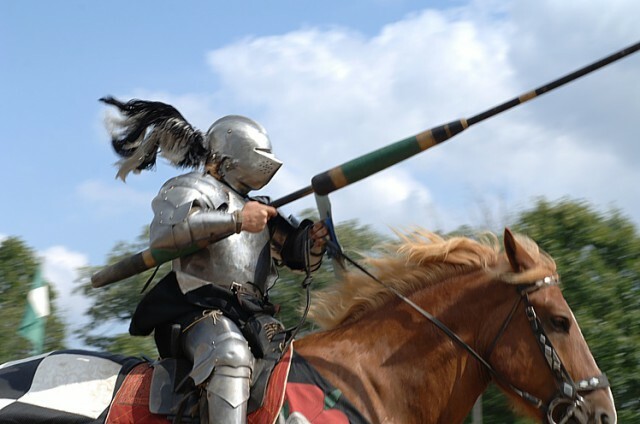 Jousting has been an American sport for more than 50 years and became the national sport of Maryland in 1962. 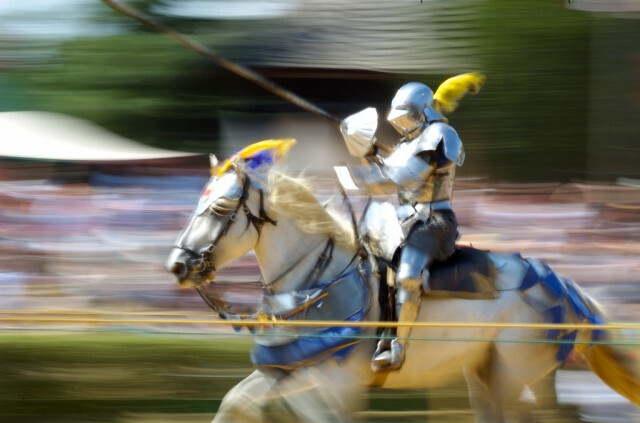 It’s a staple at Renaissance fairs across the country, and a number of organizations such as the International Jousting Association and WorldJoust Tournaments do their best to promote it. 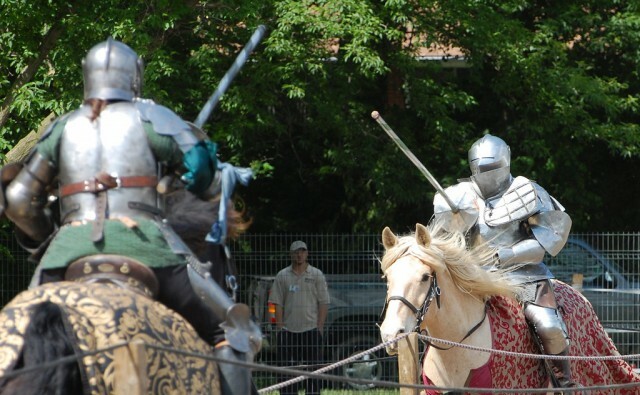 More than 15 professional jousting tournaments take place annually — not counting the weekly jousts held at Ren fairs and local barns — and prize money varies from public applause to cheques for $38,000. 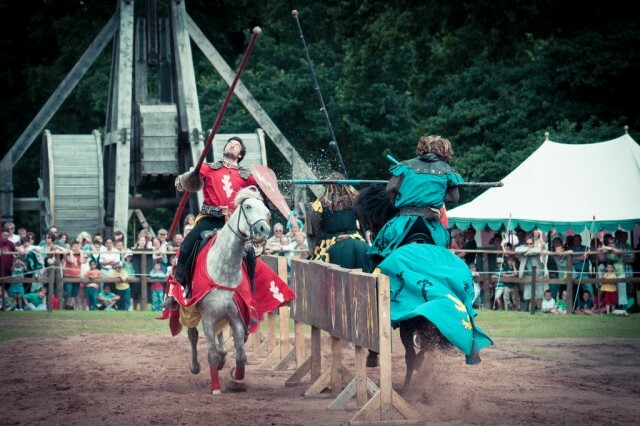 ScotFest offers the biggest cash prizes for jousts in the world, but they don’t make money by hosting jousting. “It’s expensive to put on,” Young admits. The armored lances are approximately $15 and 300 are used (total : $4500), the caps need replacing ( approx $2700) and the quartermaster and the producers draw a salary. Plus Young needs specialized safety insurance. Back then nobles ran the jousts and the lower classes and servants were denied access —even if they could afford it. The same economic barriers don’t apply today, but it’s not a cheap sport. Armor can cost $3000 and up, and then there’s equipment and horse costs. Charlie Andrews and Shane Adams both compete in full-contact jousting. Of course, jousting is dangerous and injuries are common. 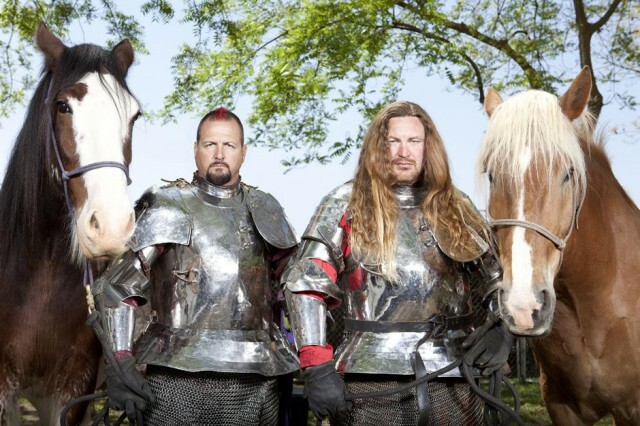 California-based Talon McKenna, star of the Knights of Mayhem TV show on National Geographic Channel, has been jousting professionally for more than 15 years and considers his cracked collarbone and forearm lucky. “Nothing serious,” he says. This story was first published on OZY.